Keep it simple when you spend time with your loved ones. No need for expensive restaurants, elaborate clothes or pricey entertainment. Unless, of course, YOU want to do those things and include your loved ones. With my mom I figured that she would be happy with Bob Evans' fine chicken and noodles or a cobb salad--comfort food instead of a higher priced venue. Also, simply taking a drive in the car and going to the drug store to look at birthday cards will sometimes do the trick. Mom would spend hours looking at anniversary and birthday cards remembering who has a birthday when. She didn't seem interested in buying any of the cards, just roaming up and down the aisles to check them out. A cup of coffee with a sweet roll or piece of cake worked for mom, too. Loved her hot coffee. I made sure it was the temperature she liked. I even made the cutting of her toenails an event. After I pampered her with that job, we ate fresh donuts and piping hot coffee. She was a happy camper. 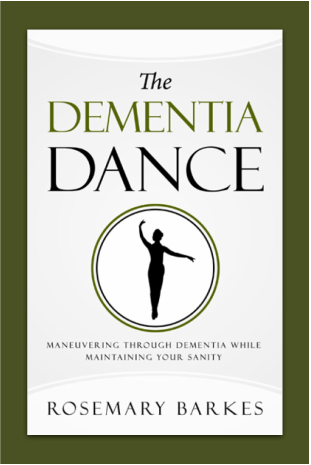 The Dementia Dance is the perfect book for anyone who is dealing with or is connected to dementia Why? Because it helps its readers to maneuver through dementia while maintaining their sanity. Let's face it. Even the word 'dementia' evokes terror in the hearts of those who are dealing with it or who have dealt with it. Rosemary Barkes understands where you are. She has been there, done that. "In 2006, when her mother asked, "Who died?" three days after her husband of 70 years passed away, Rosemary froze. She knew immediately that the ride to the funeral home and back would be a challenging one, as would the rest of their lives. Rosemary became primary caregiver for her mother for two years following the above incident. She did everything she could to make their time together as rich as possible. In the assisted living facility Rosemary found for her mom, she watched, listened and learned what worked and what didn't. Through it all, she learned how to survive the day-to-day challenges---and there were many. The Dementia Dance is a "must read" for everyone who loves anyone with dementia.